HOAs often pit Investors vs. 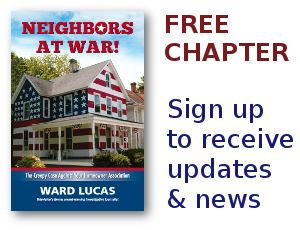 Homeowners, and homeowners usually lose - Neighbors at War! Even in the nation’s Heartland, homeowners’ and condo associations are subject to considerable consumer risk. The Des Moines Register story highlights just one example of what happens when investors take over an Association, a common occurrence across the country. Here’s the blatant truth. The corporate structure of HOAs — allocating voting rights to the Property instead of allocating those rights to People based upon residency — leads to the inevitable consequence of pitting investors against homestead property owners. Because an HOA property owner gains voting rights for EACH property owned, it creates the incentive for investors or developers to buy up – or retain – as many “shares” of the HOA corporation as possible. And everyone knows that a majority shareholder controls a corporation. But not everyone realizes that nearly all HOAs are corporations. Share this story with everyone you know, especially if they are considering buying a home. We need to decide in this country: are homes a place to live and gradually accumulate stable personal wealth over time, or are they merely investment commodities subject to the whims of a volatile real estate market – where a few people profit at the expense of everyone else? George Lucas Gets HOA Payback! The Wall Street Journal called it “Romney’s Finest Hour” (October 28, 2011). On the other hand, while the Democrats talk about protecting consumers from predatory corporations, they are not serious about it, and haven’t done ****. And they’re not going to. Ever. After several election cycles of trying to get the attention of my elected representatives (and those who want their job), I am convinced that our policy makers will never do anything on behalf of home owners, and that it’s time to put these issues to a popular vote (in states that allow ballot referendums). Too bad there isn’t anybody in my state with the means and/or connections willing to do this. Bill Brauch, who heads the state attorney general’s consumer protection division, told me he would never join a homeowners’ association. – Condo Group’s Moves Have Homeowners Crying Foul. August 18, 2012. Think about that. A state government’s Assistant Attorney General for consumer protection said that he would be powerless in an H.O.A. corporation. And then think about how even more powerless an average home owner is. Yet we have one political party that is philisophically and ideologically opposed to providing home owners with legislative relief, becasue that would be “government interference in private contracts”. And we have another political party that talks a lot about protecting consumers from predatory corporations but, for whatever reason, is unable or unwilling to actually do so. This is a problem that our legislators are not going to fix. Ever. What homeowners, HOA, etc., and those non deed restricted to a mandatory association do not understand is that in these groups HOAs etc., it does not have to be investors buying up, or attaining in some way the majority vote. It can be just one new owner, typically non residential, and their unit is a rental property, with the want to destroy the property, lives, families, health and finances of their intended victims and to drive them from their homes to steal them and they can take their place within the community, on a board, or whatever they want. Then a double whammy is when these property predators team up with other unscrupulous HOA, etc., board members and they decide they can target, farm, comb, or selectively discriminate and fabricate charges, or fraudulently assess unauthorized, non voted, illegal charges for work, or other they have no legal, or other right to contract. Probably, if they do this, they get theirs free, or they are providing jobs for friends. The innocent homeowner asks about these illegal charges and their life as they know i is over, in their community. Death threats, slapp lawsuits, more property damages, harassment, terrorizing until the innocent homeowner cannot take anymore. They are forced out so their home and equity can be stolen! Many of our courts are corrupt, it appears, and especially in the HOA cases. Wake up America!